Attached the first photo from the other day showing women feeding the ducks. Rithet’s Bog, originally part of a farm in the early 1900s, was later donated to the city of Saanich (a Victoria suburb) in the 1950s by the Guinness family of Great Britain. Its now a conservation area and preserves (to some extent) all the primal ecological plants and animals of a raised bog. I’m a meteorologist and not a plant of animal person so my comments are suspect. The ducks live in a good sized pond next to the path around the bog at the west side. In the attached pic, the first I took, are two women feeding the flock and that’s the reason the ducks are out of the water and all across the path. Not sure what the women are feeding the ducks but doubt it’s the proper stuff like you were feeding Honey and family. Those people are in PARADISE, and the picture reminds me of Seurat’s “A Sunday on the Grand Jatte“, but with ducks. I feed my ducks this stuff, which is good for adults and growing ducklings, although laying hens should get this stuff, which has extra calcium for eggshells. If you feed ducks, this is good food and a healthy diet. 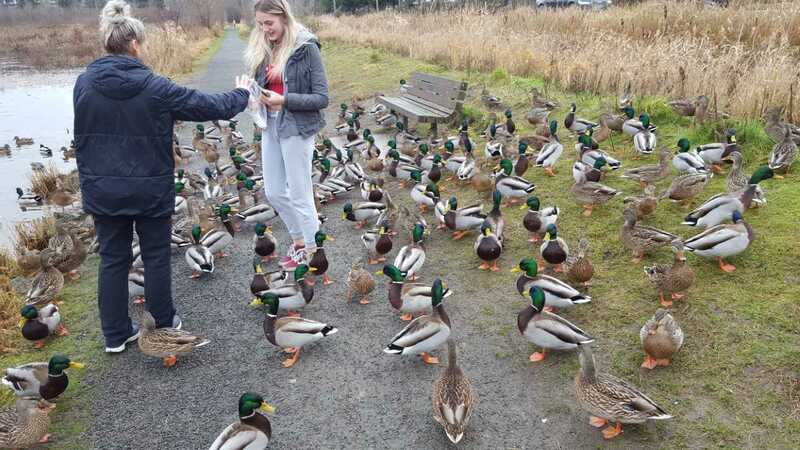 Remember, don’t give bread to ducks. They’ll eat it but it’s not good for them. I hope that woman doesn’t have bread in the bag! This entry was written by whyevolutionistrue and posted on December 26, 2018 at 3:00 pm and filed under ducks. Bookmark the permalink. Follow any comments here with the RSS feed for this post. Both comments and trackbacks are currently closed. So…. why haven’t those ducks flown south the way yours (presumably) did? Or are Canadian ducks made of sterner stuff than Chicago ducks, and winter over in place? Not sure when the photo was taken. But methinks Victoria winters are a fair bit milder than the ones in Chicago. Agreed, once I looked up where Victoria BC is located — southern end of Vancouver Island, (almost) just up the sound from Seattle. Looks like the ducks have access to a lot of open water even in the winter. That’s the key. Must be a Mallard convention. We need a mallard ballad now. Duck,duck,duck,duck,duck,duck – c’mon geese, you’re not even trying. As a Bird Rescue Volunteer I have rescued and reared many Mallards. They are awesome ducks and often the females have returned with their own wee fellas! As has been said never feed bread. I use chick crumbles when they are very small and then move on to proper duck feed and greens. Go ducks! If the Guiness company you mentioned is the one the makes the stout, it is not a British company but Irish since 1759.